The Adirondack Regional Chamber of Commerce Young Professionals Organization, together with The Post Star, has announced the honorees for the 20 Under 40 Awards. 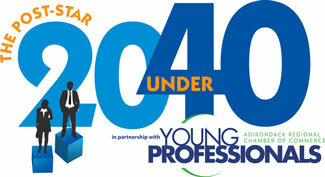 20 young business people under the age of 40 will be honored as tomorrow's leaders. These honorees were chosen because they are dedicated and successful in their vocation, role models in their careers, leaders in their businesses and communities, and active in community and volunteer participation. All were screened by prominent local leaders: Rick Emanuel, Brian Corcoran and Michael Howard. The event will be held at the Fort William Henry Resort on September 25, 2012. The event begins at 5:30 PM. Reservations are required, which can be made online. It is asked that reservations be made no later than September 19. It is $30 for a seat and a table for 10 is $280. Dan Albert, New York State Office of Counter Terrorism. Georgia K. Burkhardt, Glens Falls National Bank & Trust Co.
Erin Reid Coker, Gallery 9 North Photographic Services. Dr. Vincent Cooper., Glens Falls Hospital. Jodie Davidson, It's Your Nickel. Jackie Figueroa, Keena Staffing, Inc.
Will Groff, Family YMCA of Glens Falls. Hilary Haskell, Corinth Central School. Chelsea Little, Washington County Sheriff's Department. Adam Norton, City of Glens Falls Fire Department. Heather O' Neill, The Olde Post Grille. Sara Quartiers, South Glens Falls Middle School / Project: Cameron's Story. Craig Seybolt, Glens Falls National Bank & Trust Co.
Courtney Shaler Smith, Adirondack Health Institute. Scott Stone, Glens Falls Hospital. David VanGuilder, JMZ Architects and Planners, P.C. Paul Wersten, Glens Falls National Bank & Trust Co.
Erika L. Williams, Hudson River Community Credit Union. Mindy Wilson., Community, Work and Independence. For more information call the ARCC Young Professionals at (518) 798-1761. Updated 9.27.2012 with information about event and honorees.